1. Preheat oven to 375 FÂ° (190 CÂ°). Lightly spray an 8×8-inch glass baking dish with cooking spray. 2. Stir together the softened cream cheese, sour cream, and salsa until blended. Fold in chicken and shredded cheese. Spread a small amount of white cheese sauce onto the bottom of the baking dish. 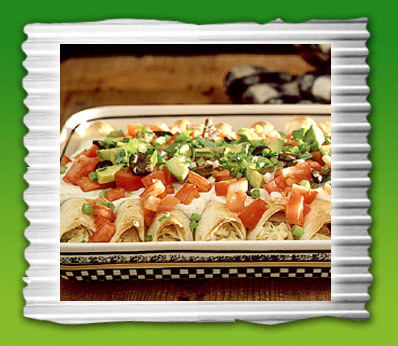 Evenly divide the filling among the tortillas, and roll into firm cylinders. Place into prepared baking dish and cover with remaining sauce. 3. Bake in preheated oven until golden and bubbly, about 30 minutes. Allow to rest 5 minutes before serving.